A moist, delicious cake recipe you don’t have to frost because the ooey-gooey cream cheese mixture becomes a frosting explosion that cracks the cake apart. Hence the name! Once upon a time, this post contained three different variations for this cake (the traditional recipe, a recipe for people who don't like coconut, and my recipe - the one pictured here). And in the post I made a few jokes about how much I love coconut and how people who don't love coconut won't like the original recipe. And so I offered the three variations of the recipe. But evidently satire and a dislike for coconut do not a good combination make soooooo.... I've just deleted all that because I can't take. one. more. email. or. comment. about how not liking coconut doesn't make you a bad person. OHHP! Wait! Can't go there! Sorry, I forgot! I guess I'll just say I decided to add chocolate chips (because who don't love chocolate chips?!) so there'd be a little more sustenance in the recipe in case someone wanted to leave out the coconut but then I loved it so much that I just decided to keep them in there permanently! All jokes (and possibly bitter commentary) aside, what I love about it is that you end up with a moist, delicious cake you don’t have to frost because the ooey-gooey cream cheese mixture becomes an internal sleeper cell frosting explosion that cracks the cake apart with its awesomeness. Spray a 13x9 (3-quart) pan with cooking spray. Scatter pecans and coconut evenly into pan. Prepare cake batter per manufacturer’s instructions and pour over pecans and coconut. Dollop heaping tablespoons of the cream cheese mixture evenly onto cake batter. Sprinkle cake with chocolate chips. Bake at 350 degrees for 40-45 minutes or until set. NOTE: Some folks have reported their cakes overflowed while cooking. Make sure your baking dish is at least a 3-quart dish (most standard 13x9 are but there are 2-quart ones out there too). I have never had this even come CLOSE to happening but you may want to set your pan on a larger baking sheet just in case. This cake looks like it could be detrimental to my diet -- therefore, I must make it immediately! I hope it's as good as it looks!! BTW -- I'm going with Everybody in the pool -- cuz that's how I roll!! Valerie, I like your way of thinking!! I stumbled across your blog and am loving these recipe ideas – especially some of the snacks! I have a son with peanut and egg allergies so I am super excited to try this brownie recipe! Thank you! This sounds amazing! Gooey, Coconut, Chocolate, And Cream Cheese?!?!! Just stop it right now!!! 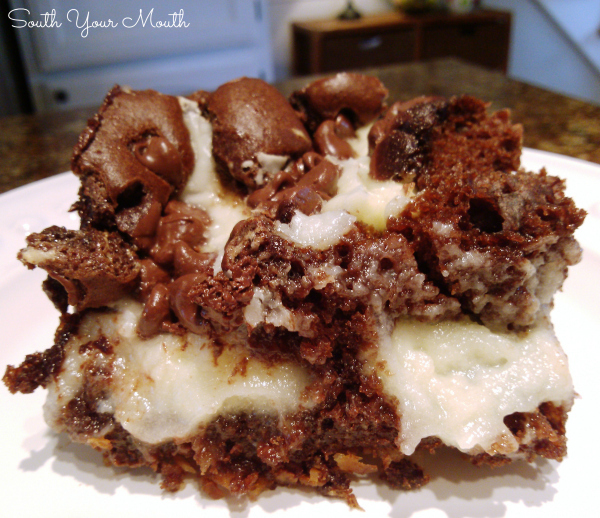 I love this cake, but have always made it with german chocolate cake mix. Chocolate chips sound like a great addition! This looks so so good! I LOVE coconut, DH does not like it though (just the texture). :P I bet it would be super duper yummy w/coconut oil! Can't wait to try it! Yummy cake...thanks for reminding me to make it!! Looks yummy I love coconut and nuts also chocolate chips so the everything way will be my way to roll for the next pot luck as I have a diabetic hubby!!! what exactly is the cream cheese mixture? looks too good!! Just read the instructions on how to make it. That will explain what is in the cream cheese. It's actually cream cheese frosting. The same one I use for my red velvet cake. I'll have to go the "Hater's way" for my daughters BD in a week! "Hater's Way", way to go. Not fond of coconut. Love Hate-er's. I need to make it soon! the picturie shows chocolate chips in the cake but I dont see it in your directions on making the cake? ?I guess you add them right befor you bake the cake?? The second two variations have the chocolate chips in the instructions. This looks sinfully delicious and I am going for the coconut and pecans! I made this cake for my family. They loved it. So I made it two days later for my co-workers.one word....DELICIOUS! What brand/type of cake mix do you use? We used Betty Crocker Chocolate Fudge cake mix. I think I used the one from Aldi when I made the one pictured above. I think. Thank you for posting the "hater's" version....I am one of those...it is funny that I love Pina Coladas though. It actually is a texture thing for me. I might try making it with coconut oil like someone suggested or not...hmm...dunno yet. HA! I'm putting that on a t-shirt! I guess I am going to have to use chips instead of pecans because I have inexplicably developed a nut allergy!! Peanuts,pecans,walnuts and almonds!! So, I love how this looks and will try with coconut and chips; will let you know how it turns out. CHILD!!!! this is a CAKE! I will make this for my next family reunion.... sounds incredible!! Try using a different flavor of cake mix. Used Carrot cake omitted the coconut. Turned out great! I love the carrot cake idea! The cream cheese frosting would be built right in! I would keep the nuts and coconut, but I usually put both in my carrot cake anyway. OK - What if you are a "partial" hater. I can't stand Coconut flakes, but I love the idea of pecans. I guess Version 2, minus the Coconut would work? This looks and sounds YUMMY! I'm putting it in my "just sounds yummy" recipe box! Thanks for sharing on WEekend Potluck! I made it for my Life group tonight gave my husband a sample he loves it I made it with pecans and coconut. i just made this and it looks yummy. but i did not notice when i bought my cake mix that it had pudding in it. it was printed in small letters on the bottom of front so i did not see it until i put my glasses on today. my mix did appear to be a little thin and as the cake is cooling the creamy mix seems to be sinking. the choc. chips are still on top though. would not have bought a pudding mix if i had been able to read that small print on the box. used to be at the top of the box in bigger letters. don't know why they want to hide that fact now. 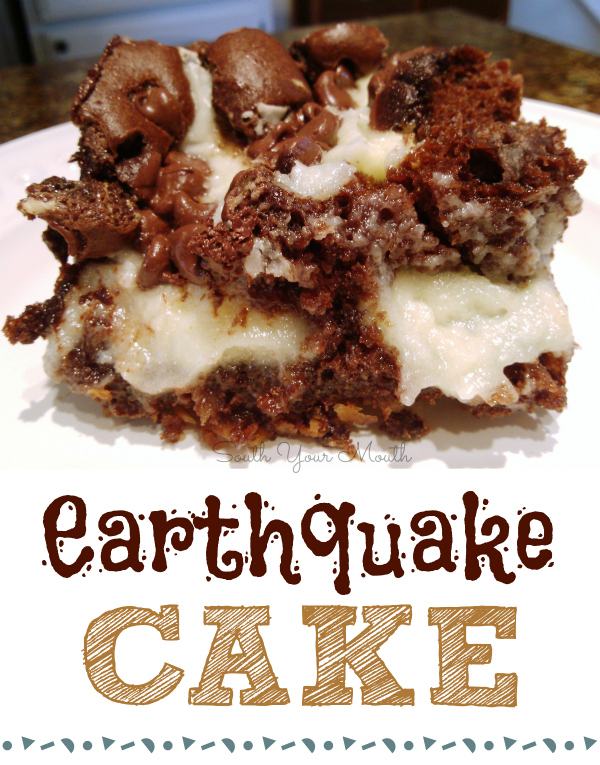 I use cake mixes with pudding in them for this recipe. They turn out great! I made this cake (Everybody in the pool version, of course) last week for a big meeting at work. I used cold black coffee, coconut oil instead of vegetable and made sure to get a German Chocolate cake mix without pudding (THANKS to the comments!!!) I didn't spread the cream cheese mix over the cake mix, just dropped in in huge dollops here and there... It turned out so ugly and perfect, and was a hit with the crowd! My husband made me promise to make it again without nuts for him. A word of warning, though.... mine bubbled up over the sides of the 9x13 dish and made a helluva mess in the bottom of the oven. Be sure and put a sheet of aluminum foil down to catch the overflow! Interesting about the cream cheese mixture. The recipe that I have made for years does not require the butter to be melted, just mix the butter, cream cheese and 1 lb of powder sugar together and drop by spoonfuls on top of the cake batter. I also use a German Chocolate cake mix. Never had an overflow problem. Might have to try this with the melted butter in the cream cheese mixture. My grandma used to make this cake for special occasions so I made it for my mother in law's birthday and it was a hit! Thanks for the recipe. I would love to make this for a work party but I have a co-worker that is gluten intolerant. could I make it gluten free? I am gluten intolerant. You can find gluten free cake mixes at Aldi and other grocery stores. I have used those mixes in other recipes. It would be worth trying. It is a great pleasure whenever someone bakes something gluten free for me. can t find that cake mix. I also make a vanilla cake mix omit the coconut and pecans. Make the cream cheese etc. Dollops on top. This is really good. I will make this, practice making this until it's perfect. I kept watching it and then at the very end, it ran over a little bit. Maybe because I used a glass pan? Anyway, next time planning on trying with a brownie mix. im not a nut hater i love nuts they just don't love me back... as in make me deathly ill coconut included. thank you for the second variation. Does this need to be refrigerated after making? No, just store in an airtight container. Wow Girl! 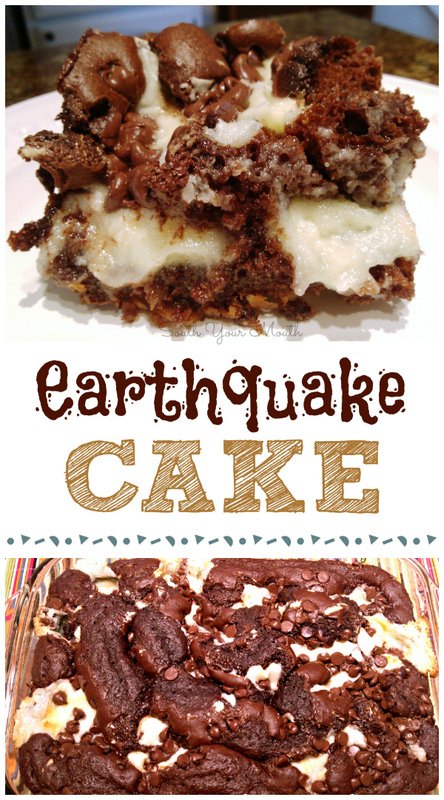 I've made Earthquake Cake...I've eaten it made by others as well, but I've never seen one as gooey and luscious looking as this photo! YUUMMMM! Thanks for sharing with us at Weekend Potluck. Congrats Mandy! This recipe received most clicks at last week's Weekend Potluck party. Keep 'em comin Gal! Thanks so much for your faithfulness to share with us. I"d like to try that with walnuts too. I cant figure out how to add this recipe to my collection that comes up (I don't remember putting anything there, but I must have!) I don't want to lose this recipe, I plan to make it over and over again, starting with our church potluck tomorrow!! They love my chocolate cakes, so I'm going to take it up a notch!! Thanks! I don't like coconut. Can you add pecans to the "hater's" version? Getting ready to pull out of oven!! I made this with a german chocolate cake mix, dark chocolate chips and I used coconut oil instead of butter. Dangerously yummy! I remember having this at belterra casino in Kentucky..never had it since. But I am movimpng to Ohio in two weeks. I think this is the first thing I am gonna try. O my gosh. Is my tongue ready. Thank you. I will let ya all know how it went. I just pulled this out of the oven and man, oh, man! It smells and looks amazing! Thanks so much for the recipe. I've made this cake many times, usually the traditional way. However one day, I decided to go the Hater's Way, baked the cake, then put the traditional coconut pecan icing on top. Delicious! I love checking out all these awesome recipes. 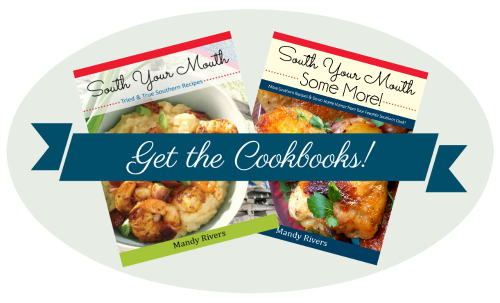 I'm not creative in the kitchen, so I love a good recipe! So many really good recipes have cream cheese in them. My family likes it, but I just don't care for it! What could possibly be a subsitute for cream cheese? Hi Mandy, I have been making this cake forever but just called it German Chocolate Upside Down cake, didn't know there was another name for it - but no matter what it's called it is delicious and I am getting ready to make another one to take to my family reunion. Thanks for the other versions - I may try to make one without the coconut for my daughter who does not like the texture and doesn't like nuts. I think anything with this cream cheese mixture in it has to be a winner! I received this recipe as "Upside down german chocolate cake" about 20 years or so ago. Have been making it for almost every birthday in the family since then with devils food cake mix. My family loves it! Thanks for the post! Never saw this recipe before but it sounds and LOOKS amazing!!!! I bake for a club I belong today, guess what they are getting next Monday night :). Thanks SO MUCH for the recipe! Delicious. Just doesn't last around here. I use German chocolate mix. I always sub butter and buttermilk in the mixes I use for the oil and water. Did the same here. No complaints. Thank you for your site. I made this yesterday for Father's Day. Man, oh man, is it fantastic! My 28 year old nephew said I can make it for him anyday! My 14 year old daughter, who is a very picky eater, loves it and is having a piece for breakfast this morning. She wants me to make it again very soon. I used a dark chocolate cake mix and made the everyone in the pool version and baked it in a glass pan (didn't run over). It took forever to cook all the way in the middle -- maybe 20 minutes extra -- but was well worth the wait. It would be awesome served warm with a scoop of yummy vanilla ice cream. Made this today...it is good, however if I make again, I will combine the nuts and coconut with the cake mix. Layering them on the bottom left them there. They did not scoop out well with the cake! Has anyone tried this in a bundt cake pan? If so does the baking time and temperature change? My daughter and hubby got into a debate over what kind of cake to have for HER birthday a few years back. 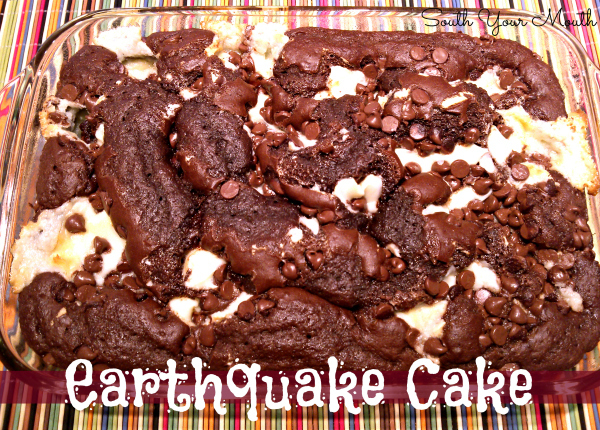 He wanted me to make an earthquake cake, she wanted me to make a strawberry cake. So I compromised and made a Strawberry Earthquake Cake. ...now we make it every year for her birthday! This cake was delicious but the cream cheese mixture blended into the cake, didn't stay separate. Not sure what I did wrong. I did mix the pecans and coconut into the batter as someone else suggested. It was still good and moist, just didn't have any white.